That is why, at GreenBlue Urban, we recommend StrataCells as offering a best practice methodology for urban tree planting. StrataCells look after the vital physical soil structure. When loaded with a quality soil, 94% of the volume provided by the structure is occupied by topsoil and available for the tree, providing and nurturing a ‘forest floor environment’ within the busiest towns and city locations. Industry experts generally agree that, so called ‘compactable’ sand planting mediums tend to be very low in organic content, which necessitates large volumes to achieve minimum nutrient levels. Furthermore, being sand, it can quickly leach those beneficial nutrients, so an ongoing nutrient replenishment program is recommended. Soil on the other hand generally has a much better mineral and organic balance, which will incorporate sand, but along with silt and clay, with a far higher quantity of organic and nutritional product by volume. 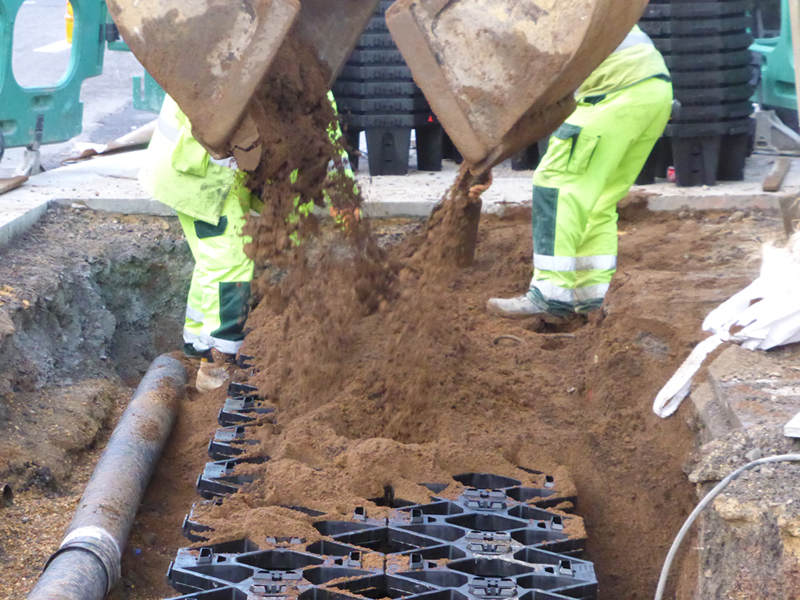 Because of this, a smaller volume tree pit can be achieved – which is an all important consideration in street tree planting, reducing costs, expensive excavations, and also reducing potential damage to existing important underground services. GreenBlue Urban soil structure systems such as StrataCell, safeguard that all important root zone, keeping the load off the soil, and keeping the soil open and free draining – giving trees a real long term future – for the benefit of generations to come.